Animal lover and ex-Edmonton Oiler Georges Laraque has pledged his voice, and his wallet, in the campaign to move an isolated elephant to a sanctuary in California. 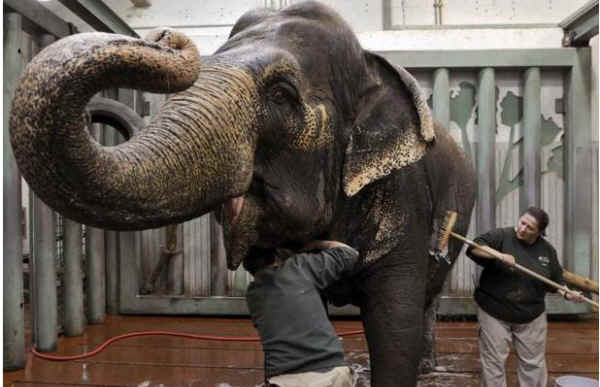 Lucy, a 35-year old Asian elephant, has been at Edmonton Valley Zoo since she was two years old. Critics of the zoo have stated that the cold climate, lack of space, and social isolation have caused Lucy physical and psychological damage manifesting in abnormal behaviors such as rocking back and forth. “I want to meet with Mayor (Stephen) Mandel when I come down to Edmonton and really talk about what Lucy is going through. This is unethical,” says Laraque in a conversation with the Edmonton Sun. In a letter sent to Mayor Mandel last week, Laraque stated the case for Lucy and went on to pledge money for Edmonton’s community projects if her transfer went ahead.